Nobody forgets Georgia's cuisine. Born of a landscape rich in alluvial minerals washed down from snow-capped mountains, the vegetables, fruits, meats, cheeses have spawned a very individual culture of food. Much is still unadulterated and naturally healthy, like Matsoni, Georgian yoghurt. Numerous aromatic wild herbs give the dishes their special and unique aroma. The Georgian table is an Aladdin's cave of culinary discovery. Visitors always remark on the amazing abundance of so many unfamiliar but mouth-watering dishes that seem to just keep on coming. Key among these are Khachapuri, the traditional cheese-bread of Georgia; and Tkemali, the several kinds of delicious sour plum sauces born of Georgia's popular Tkemali tree. There is also baje, a rich garlic and creamed walnut sauce; Pkhali, the generic term for numerous vegetable pates made with ground walnuts; Khinkali, the famous dough pockets filled with meat; and Satsivi, chicken in walnut sauce. Do not forget the delicious Georgian Mtsvadi, meat grilled to perfection over a vine-wood fire; Ajika, the devil's own spicy, hot sauce and Churchkhela, hazeland walnuts stung together in a thickened wine sauce. All these have their tastes refined and heightened by Georgia's unique selection of wines. And these are only some of the treats waiting at the Georgian feast or supra. With such an abundance of delicious food and wine, over the centuries Georgia has developed a strong tradition of table culture. Not content with merely eating and drinking, the ceremony has evolved into a key stratagem of cultural survival. 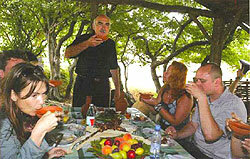 Georgians have a saying that the guest is the gift from God. Essential to the table ceremony is the Tamada or toast-master. He guides the mood of the meal by introducing eloquent, often moving toasts at key moments, starting with friendship. Glasses are raised then drained bolomde - to the bottom. Guests are sometimes invited to add their own words alaverdi, as all the while the assigned glass-filler, or merikipe, ensures the glasses are primed for the next toast. A feast, or supra, accompanies all key events of Georgian life and stands at the heart of Georgia's famed hospitality. Be prepared... and remember the best response to a toast is the word Gaumarjos! which translates to our Victory! Follow the footsteps of Jason and his Argonauts into the land of hospitality. Take the old silk road to this vital crossroads between Europe and Asia. Experience for yourself the superb cuisine; numerous delicious wines, polyphonic songs; wild mountain dances - in fact the full range of Georgia's famous hospitality!